The room numbers are those referred to on the pompeiiinpictures pages for VI.9.3-5 and VI.9.10-12. 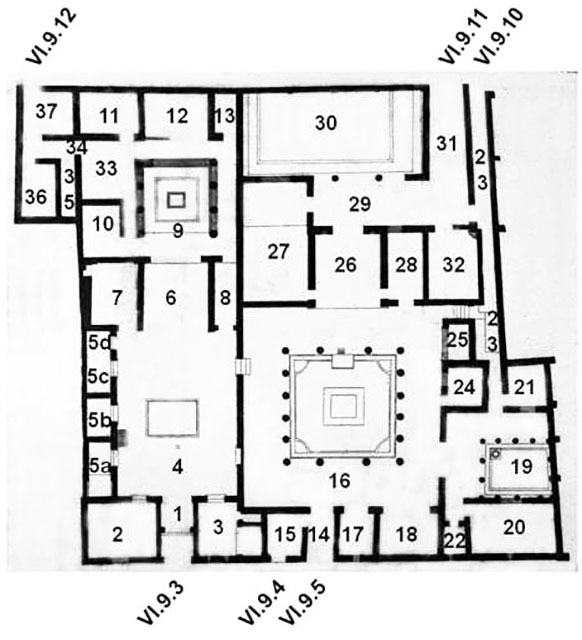 The plan shows the entrances at VI.9.3, VI.9.4, VI.9.5, VI.9.10, VI.9.11 and VI.9.12. VI.9.3 pages contain rooms 1 to 13 and 33 to 37. VI.9.4 page contains room 15. VI.9.5 pages contain rooms 14, 16 to 22, the south part of corridor 23, and rooms 24 to 30. VI.9.10 pages contain the north part of corridor 23 and all the underground rooms and kitchen with lararium painting. VI.9.11 page contains room 27 ,28, 29, 30, 31, 32. VI.9.12 page contains rooms 36 and 37. VI.9.10 Pompeii. 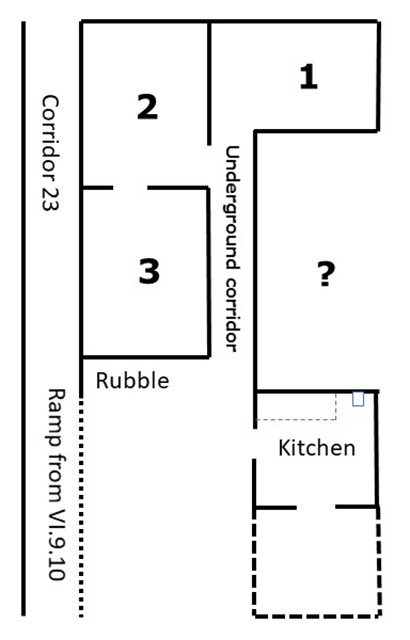 Sketch plan showing approximate positions only of underground rooms. This plan is only to give a rough idea of the layout and the sizes are not accurate. Please be aware that all room numbers shown reflect the sequence in which we photographed the rooms and will differ from any other plans or records both published and unpublished.